Dr. Kwabena Duffuor, former governor of the Bank of Ghana appears to be readying himself to become the presidential candidate of the Convention People's Party (CPP) in the 2008 elections. Party sources say that he has won the support of key old guards and activists and support groups are springing up across the country. Dr. Duffuor is currently the Chairman of the Star Assurance Company and has significant interests in other businesses including the Heritage newspaper'. He is expected to battle with other party stalwarts who have declared interest in becoming the presidential candidate of the CPP. These stalwarts include Mr. George Aggudey, presidential candidate of the party in the 2004 elections and Dr. Kwesi Nduom, a minister in the Kufuor administration. 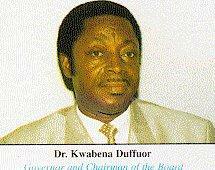 Insiders say that Mr. Aggudey is likely to give Dr. Duffuor a tough challenge. Mr. Aggudey has also set up a network of campaigners across the country and said to be financially well endowed. Given the apparent loss of confidence in the Kufuor administration, Dr. Nduom will have a difficult time convincing delegates at the CPP congress to vote for him. His only salvation may lie in jumping off the sinking ship early enough. Dr. Duffuor has been active in the CPP since the 2000 elections when he helped mobilize resources for the party's campaign. He is known to have sponsored several parliamentary candidates of the party in the 2004 elections. He is currently a member of the finance committee of the party and has become a recognizable CPP face. The youth wings of the Convention People's Party (CPP) and the People's National Convention (PNC) on Tuesday urged the leadership of the two Nkrumaist parties to unite or face mass youth agitation." The CPP used mass agitation 'the positive action' during the struggle for political independence of Gold Coast (Ghana); we are ready to embark on a relentless popular agitation to force our leaders either out of office or to adhere to the grassroots call for unity," the CPP/PNC youth stated at a press conference in Accra. The press conference titled: "Speed Up The Unification Process," was used as platform by the Youth Wing of the two parties known as Positive Action Group to express their disgust at the apparent lack of faith by leading members of the two parties towards Nkrumaist Unity for Elections 2008. The leadership of CPP and of the PNC recently agreed to endorse the decision of the two parties to unite.The decision followed a stage reached at the previous Nkrumaist Unity Talks on April 15, this year, in Accra. Addressing the press conference, Mr Oteng Anane, the National Youth Leader of the CPP explained that since the announcement on April 17, this year, that they would unite the two parties have not exhibited the needed urgency for unity and continue to seek for personal interest. "We would no longer tolerate any further foot dragging of the leadership or any other member, " the youth stated and called on the leadership to immediately come out with a Unity Time table. The youth also condemned some leading members of the CPP who have adopted an entrenched position towards the unity talks, saying modern day elections are not won on the basis of slogans and symbols but on issues and organisation. They therefore urged the leaders to collaborate for the attainment of lasting unity of all Nkrumaist Parties. The two parties decided to adopt the name "Convention People's Party" (CPP) and the "Coconut" of the PNC as a symbol with the motto "Forward Ever with Honest Service." A six-member committee drawn from the leadership of each party was formed to collate major decisions reached with respect to a common constitution and political platform for consideration by both parties. Meanwhile the Chairman of the CPP, Dr Edmund Delle, in an interview with Ghana News Agency explained that the two parties adopted a platform for merger, stressing, "We have only crossed the first hurdle in the establishment of good faith to guide our activities in the quest for unity". 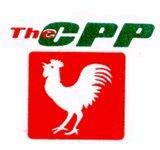 The CPP Chairman urged the members to channel their concerns and suggestions through the Unity Platform. "We must not forget that negotiations is about give and take, we cannot in one breath be calling for concession from our partners, whilst we stick to our position. "If the unity is crucial to us, then we must be prepared to sacrifice for the attainment of unity, the grass roots are calling on us to unite," and asked "what is paramount, Unity with new symbol and slogan or staying fragmented with our symbols and slogans"? He said after that the document would be presented to the legal committee for submission to the National Delegates Congress of the two parties for consideration.Dr Delle said after Congress, "then we will start the registration procedure at the Electoral Commission. "He said, "what we have done now is working out an organisational programme for the attainment of united progressive activism in the country." The Central Regional Executive Committee of the Convention People's Party (CPP) has passed a vote of no confidence in its Regional Chairman, Safohene Araba Bentsil Enchil. A resolution adopted and signed by members of the Executive Committee at an emergency meeting at Elmina on Saturday, said Safohene Enchil functioned as the First National Vice-Chairperson of the party and due the many positions she held she was unable to devote her full attention to the Region. They accused her of possessing undemocratic tendencies and inefficiency in helping to re-organise the party. The resolution said funds raised in the name of the party were dissipated according to her whims and caprices without the knowledge of the Regional Executives particularly the Regional Treasurer. It said she usurped the role of executive members at all levels. The resolution said she would not have the time to sacrifice to ensure that the party gained strength and credibility. Meanwhile Safohene Bentsil Enchil has been replaced with Mr Solomon Boamah, the Regional First Vice Chairman. Thirteen (13) Constituency chairmen of the Convention Peoples Party (CPP),in the Eastern Region have given the Regional Steering Committee of the party a two- week ultimatum to convene an emergency meeting, to discuss grave and pertinent problems of the CPP. The chairmen who gave the ultimatum in a resolution passed at a meeting to commemorate the 33rd anniversary of the death of Osagyefo Dr Kwame Nkrumah, at Koforidua on April 27, described the problems as "threatening the break-up and demise of our great party".The resolution warned that if the Regional Chairman, Nana Owusu-Sekyere failed to call the meeting on or before May 19, the Regional Executive of the constituency chairmen would decide on the next course of action. The resolution, which was copied to the General Secretary of the Party, the parties parliamentary candidates in Election 2004 and the media houses, set out an agenda for an emergency meeting including a discussion of the party's performance in the election and rendering of account of stewardship of the Steering Committee. Mr Albert Atutiga, Acting Northern Regional chairman of the Convention People's Party (CPP) on Monday proposed the adoption and use of a neutral symbol by Nkrumaist parties for the interest of true unity. "The adoption and use of a neutral symbol would solve the current misunderstanding between some members of the parties about the use of the PNC party symbol", he told the Ghana News Agency in an interview in Tamale. Mr Atutiga held that the use of the PNC symbol was causing confusion among some party members at the national level to the detriment of the growth of unity parties. "We in the Northern region are united and we support the use of the PNC party symbol, but if others do not agree with the use of the symbol, I suggest we go for a neutral one and forget the rest of the symbols," he reiterated. The acting chairman said he received reliable information from Accra indicating that some Nkrumaists were still against the use of the PNC party symbol and advised them not to worry about it because "symbols do not win elections." He called on the leadership to reach an agreement on the issue before the 2008 elections in order to ensure Nkrumaists victory, adding that a united Nkrumaist party remains the only alternative to the NPP. He said the NPP did not win the two elections because of its elephant symbol but because of its manifesto and good human relations. "If symbols will win elections the NPP would have lost because the elephant is a fearful animal, which no one will like get close to," he stressed. Mr Atutiga said what was important was for Nkrumaists to work tirelessly to strengthen the unity and take advantage of the weaknesses and failures of the NPP to win the 2008 elections. The Convention People's Party (CPP) on Saturday urged political parties in the country to adopt the practices of diplomatic politicking to forge unity for national development. Dr Edmund Delle, CPP Chairman, who told the Ghana News Agency (GNA) in an interview in Accra noted that the current antagonism, tribal and political vindictiveness, intolerance, undermining of opponents, especially among functionaries of the ruling New Patriotic Party (NPP) and other opposition parties is cruising the nation to a gloomy destination.He said the modern trend of multi-party democracy is based on the philosophy of diplomatic politicking, which opens the door for healthy bilateral dialoguing among political opponents. Dr. Delle said: "politics have moved from the ground of hostilities, brutalities to dialoguing," adding all political parties aimed at attaining power to govern the country to improve the lot of the people. He said the adoption of a common platform for chairmen of NPP, CPP, National Democratic Congress (NDC) and the People's National Convention (PNC) during the last general elections was to imbue diplomatic politicking into the Ghanaian system.The CPP leader urged the political parties, Institute for Democratic Governance (IDEG), Institute of Economic Affairs (IEA), Ghana Centre for Democratic Governance (CDD-Ghana) media and other democratic institutions to facilitate the introduction of diplomatic politicking into Ghanaian politics. "Politicians are not enemies, we are one people with different political ideology on how to reach a national goal," Dr Delle said. On the Nkrumaist Unity, Dr Delle said the fundamental platform for merger between the CPP and PNC have been adopted. We have only crossed the first hurdle - establishment of good faith to guide our activities in the quest for unity. The discussions and common platform would be circulated throughout the various structures at the constituency, ward and lower levels of both parties to debate and work out common modalities to build consensus for unity.He said after the discussions and sensitisation, the proposed document would be present to a legal committee for onward submission to National Delegates Congress of the two parties for adoption or otherwise.Dr Delle said after Congress, "then we will start the registration procedure at the Electoral Commission." He said, "what we have done now is working out an organisational programme for the attainment of united progressive activism in the country. ''He urged members of the two parties to organize internal discussions on the modalities and make the appropriate inputs for a comprehensive document. The political parties that identify with the Nkrumaist tradition since the inception of the fourth republican constitution have made several attempts to forge united front for future elections. The Nkrumaist Parties - Great Consolidated Popular Party (GCPP), CPP, PNC and the National Reform Party (NRP) after every general election attempted to forge unity but entrenched positions by some of the past and present leadership hindered the talk. The leaderships of the CPP and PNC the only Nkrumaist parties who contested the 2004 Presidential election have again started another unity talks.Dr Delle urged the leadership of the both parties, national, regional, constituency and ward levels to approach the on-going unity talks with the goodwill that would help achieve the desired unity expeditiously. The CPP Leader said that as a result of the divisions in the Nkrumaists front, many of its sympathisers "are sitting on the fence and will surely receive the announcement of the achievement of unity with joy." Kwame Boateng to contest the CPP presidential slotKumasi, May 11, GNA-Mr Kwame Appiah Boateng, the 2004 Convention People's Party (CPP) parliamentary candidate for the Nhyiaeso constituency, on Wednesday said he would contest for the party's presidential slot in order to run for the 2008 presidential election. He said the decision followed an incessant call from both within and outside the CPP on him to challenge the 2004 flag-bearer, Mr George Aggudey and win the 2008 presidential elections for the party. Mr Boateng in an interview with the GNA in Kumasi, said he had decided to respond to the noble call of the people to take up the challenge to serve Ghana. He pledged that if he should win the presidential slot, he would deal a devastating blow to both the NPP and the NDC and lead the CPP to victory in the 2008. Mr Boateng said he was as a neo-Nkrumaist committed to the ideas and ideals of democracy, freedom, liberty, free enterprise and social democracy. He said the magic of the CPP was back, saying "the myth of Dr Nkrumah's political victory shall be repeated in 2008". Mr Boateng said if he became President, he would call for a referendum on Ghana's neo-colonialist status and encourage Ghanaians to be less dependent and self- reliant. He also said he would promote and strengthen Ghana's cultural and diplomatic ties with the USA and other freedom loving and democratic countries if he should win elections. Mr Boateng said a CPP government would promote the welfare of Ghanaians and create greater opportunities for women and empower them to develop their potentials. Mr Boateng appealed to well to do members of the party to support him financially to enable him to contest the elections. He appealed to NDC and NPP supporters to join and support the CPP to ensure permanent peace and stability and promote economic and political freedom for Ghana. Leader (Neo-Nkrumahist Convention) The Neo-Nkrumahists are fully committed to the CONVENTION PEOPLES PARTY of the Republic of Ghana. WHO WE ARE We are second generation Nkrumahists. Our oldest members were born after Ghana’s independence so none of us has any claim to the hey days of Nkrumah. We have come together as a result of our realisation of what the Osagyefo really stood for. We intend to continue his good works and protect his legacy. OBJECTIVE. To maintain the influence of the Osagyefo’s political thinking at all times and realise his vision for Ghana and Africa. THE NEO- NKRUMAHIST REVOLUTION The revolution is a programme of coordinated actions necessary to ensure the achievement of the NEO-NKRUMAHIST objective. STAGE ONE Membership Drive Campaign STAGE TWO Creation of government-in-waiting STAGE THREE Final onslaught: CPP Government in power. HOW TO JOIN You are welcome to join us. There is no membership fee to pay. You do not have to be a card-carrying member of the CPP before you join. Send email to membership@neo-nkrumahist.org for electronic application form.